The 2019 baseball season has begun. The hapless Orioles have a winning record for the first time in a year, the Nationals and Cubs stumbled out of the starting gate, and the defending National League East champion Atlanta Braves are winless. Baseball is a long grind, a team is never as good as they look when they’re winning nor as bad as they look when they’re losing, and the narratives of the opening weekend won’t hold true for six months. There’s lots of baseball still to play. This coming Saturday, April 6th, I’m attending my first Harrisburg Senators game of the year. I don’t even remember who they’re playing. Honestly, it hardly matters. I’ll be in the bleachers on the first base side — my favorite place to watch a game there — and, win or lose, it will be great. Hmm. A hot dog, with pulled pork and macaroni and cheese, topped with barbecue sauce. I’ve no idea if The Spot, the specialty hot dog stand at FNB Field in Harrisburg, is offering the LeCroy this year, named after long-time Senators’ manager Matt LeCroy, but that was something I could put together on my own. I did the same several years ago when the Chicago Cubs offered a reuben hot dog to mark Wrigley Fields’ 100th anniversary; I wasn’t making it out to Chicago, but I could assemble such a monstrosity easily enough. So, that’s what I did last night for dinner. I broiled some hot dogs, I heated up some pulled pork, I made myself a pot of Kraft Mac and Cheese, and I assembled the thing. 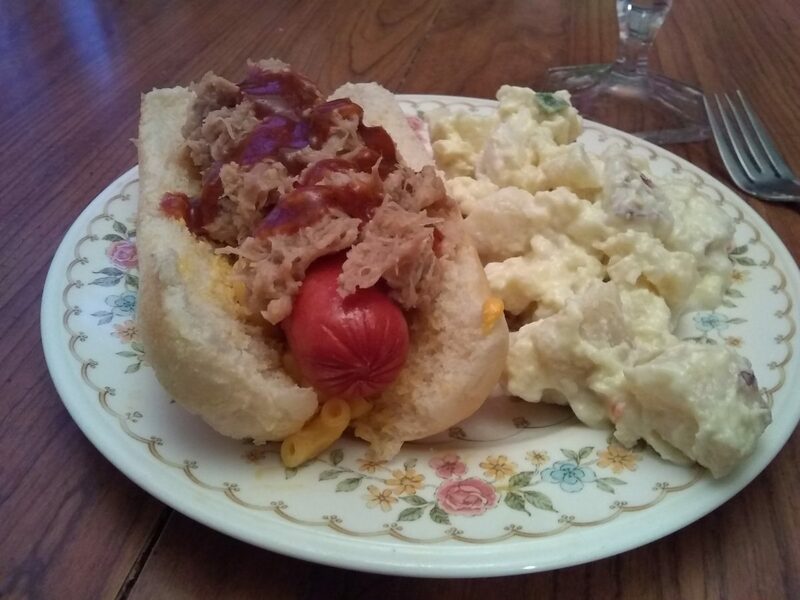 I’m not sure I really noticed the mac and cheese, but the beef frank and pulled pork worked well together, and the Heinz Carolina-style barbecue sauce I had on hand was appropriately tangy. It was a little sloppy, but that’s why one has paper towels. If The Spot has the LeCroy on the menu this weekend or sometime later this summer, it will be a dining option, for sure.